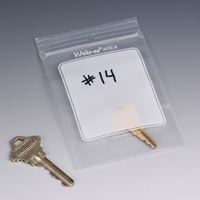 Same quality as a premium Write-on® zipper bag and costs less! Reinforced spot-welded zipper and side-weld construction for reusable toughness. Convenient hang hole. Meets FDA and USDA specifications for food contact. Call for details about custom printing and additional sizes, colors, mil thicknesses, tamper-evident styles, and writing areas. Usable dimensions are slightly smaller.